Hi, I am interested in your 1990 GMC Suburban 2WD 2500 (stock #0991-NSH) listed on Autotrader for $11,995. I'd like to get more information about this vehicle and confirm its availability. This is the original Sport Utility Vehicle. Or at least its the one that has dominated in the utility category for so many people for so many years. This one could be called a Survivor because it appears it is still largely original and it has plenty more miles to offer its next owner. This truck can haul a pile of people, haul a load, or do both at the same time. Check it out. White is a good color for both a traveling or a work truck. It keeps the heat gain down and is easy to keep looking clean. Give it a quick wash if you get some mud on it and its ready for another adventure. This truck is all about form following function. Quad headlights provide great lighting up front. Drip rails over the doors keep you from getting wet when you open the door in the rain like on so many of the new cars. Running boards are wide and strong providing a solid step up into the cab. Out back the tailgate has a roll down window and when you drop the gate, you have great access to the back. After you unload or set up, it can be a table, or seating, or a workbench. When you head for the game, (or the job site), your stuff is safe and secure inside. There is a heavy-duty receiver for towing and it has trailer wiring for lights and brakes set up already. Inside you will find a comfortable cloth interior with a serious command center for the driver, and comfort for the passengers. The driver has all the window switches at his finger-tips with a real deal map pocket just below it. There are big ol mirrors on both sides of the truck so you can keep track of whats around you in traffic, even when you are towing, and the tilt wheel is nicely adjustable for parking lot maneuvering or long-distance cruising. A Panasonic AM/FM/CD player is there for your listening pleasure and a monster console has cup holders in the front and a console as big as a small cooler! Your passengers will be comfortable in the back seat which is as big as a limo with crushed velour upholstery and rear A/C system to keep them cool. The seat is split 60/40 so that two people can sit with long cargo on the side, or the other way around. Lots of cargo and room for one more. Pop the hood and you will find the workhorse powerplant that makes this truck so capable. Its a big block 454 cubic inch motor that makes big power down low and does it without a lot of drama. It is all stock with evidence of good regular maintenance in the newer belts, hoses, battery and brake booster. The power it makes is sent back through a 3-speed automatic transmission. The rubber meets the road through 33X12.50R16 tires mounted on aluminum rims. 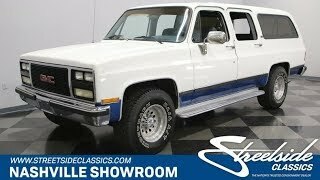 A good looking, hard working Suburban at a great price. A Sport and Utility vehicle that has built its reputation in both areas. Come on down and check it out. It may be just the truck you have been looking for.